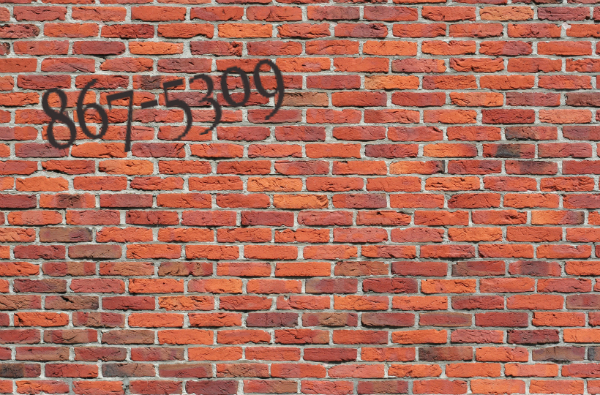 When you hear the number “588-2300” do you immediately bust out with ‘Empire’ in a sing-song voice? Have you ever prank called 867-5309 (be honest)? How much is your decision about who to call for a taxi based on what jingle you remember? There’s strength in numbers. Empire Today rode that famous phone number all of the way to a position as one of the country’s largest specialty flooring retailers. In 2009, a nutritional supplement company leased 800-867-5309 for $25 million. Ebay auctions for area code-specific versions of the number have reached seven figure bids. A study of password data even showed that 8675309 is the fourth most popular seven digit password. Numbers count. Even today, when all of our important numbers are in our cell phones or on our speed dials, your phone number matters. While toll-free numbers are obviously important, having a local phone is just as powerful. Having a local number signals to potential customers that you’re in their area, you’re part of their community, that you’re there if they need help. Aside from instilling consumer confidence, having a local number also helps with all-important Google search results. Google’s local business listings guidelines strongly suggest you have a local phone number for your business. A local number essentially gives you “extra credit” and will help boost where you show up in local search rankings. These local searches, particularly when done on phones or tablets, simply convert at astonishing rates. With the TDS managedIP Hosted suite of products you can now get a telephone number from virtually anywhere in the United States and provide a local presence whether or not you have a physical location in the area. And, if you move your business to a new location, you can even take your old number with you, so you don’t lose any branding equity (imagine if Empire lost 588-2300!). Even if we don’t all have “Jenny’s” phone number, the numbers you do have are vital assets to your business.